All right. 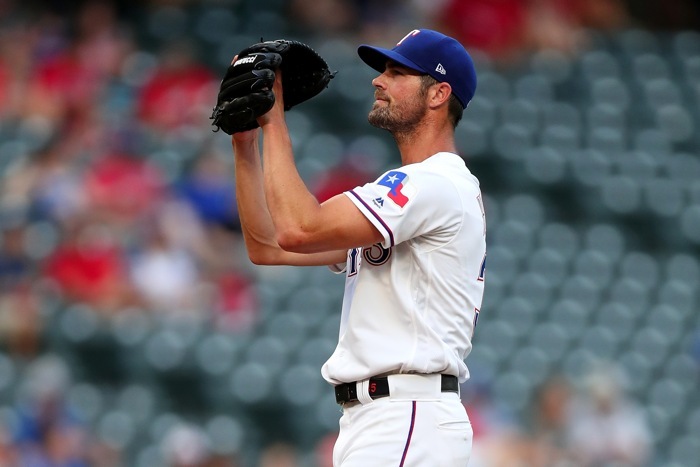 After a day of feverish updates that mostly pointed to the Chicago Cubs working hard to land Texas Rangers lefty Cole Hamels, we’re switching to a new post, because word is that a deal is in place. Evan Grant is a Rangers beat writer, and was the first to note several days ago that the Cubs – among other teams – had been scouting Hamels. Earlier rumors had the Cubs taking on about $4 million of the $14ish million Hamels is owed for the rest of this year plus the buyout of his 2019 option. In return, the Rangers would be getting lower-level prospects. We don’t know names yet, but we do know that breakout pitching prospect Rollie Lacy was scratched, and outfield prospect DJ Wilson was activated from the disabled list but is not playing tonight. Much more on Hamels – and the advisability of trading for him – here. UPDATE 2: Some stray thoughts while we await more details. First, if there is no phantom injury elsewhere in the rotation, it’ll be interesting to see if the Cubs go six-man, or if they bounce one of Tyler Chatwood or Mike Montgomery to the bullpen. Each has been in the bullpen in his big league career, so it wouldn’t be outrageous, though I question what Chatwood’s role would look like as a reliever if he can’t throw strikes. Buried, I suppose. I don’t believe this has a *direct* bearing on how the Cubs feel about Yu Darvish coming back this year. Instead, I think it’s exactly like Theo Epstein said this week: you hope he comes back and do your best to plan what you think is likely, but if you sit there at the deadline and COUNT on Darvish to return and contribute when that hasn’t happened this year, then you’re the one who wears the blame if “bad luck” strikes. This offers more protection against bad luck. UPDATE 4: Something else that could help Hamels in his transition to the Cubs? By BP’s defensive efficiency metric, he’s been pitching in front of the 6th worst defense in baseball this year. He’ll be coming to the 5th best. Lacy, 23, was the Cubs’ 11th round pick last year, and was brilliant at Low-A to start the season and was recently promoted to High-A. Source confirms my kids are finally asleep. … Two sources say #Rangers are getting two pitchers and a ptbnl. Rollie Lacy is one. The other is “not a prospect,” one source says. Not clear if that means a Cubs player or a low-upside minor-leaguer. Next Post Next post:With Cole Hamels on the Way, Do the Cubs Finally Go with a Six-Man Rotation?